Clam bakes are back - click for more info! until the first lobster will be served for the 2019 season! 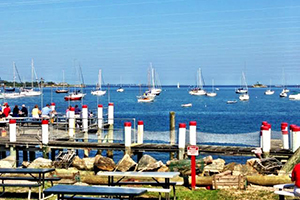 Welcome to Abbott’s Lobsters in Noank, CT! 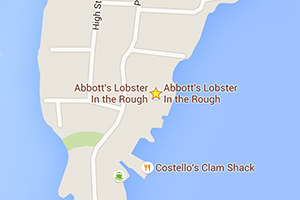 Abbott’s Lobster was founded in 1947! 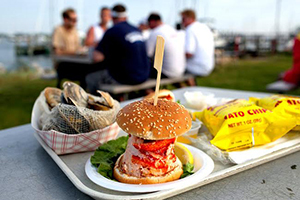 Over the decades, we’ve become as popular for our seafood as for our lobster. You’ll love our steamers, stuffed clams, clam chowder — acclaimed the best of its kind by food writers and reporters worldwide. Clams and oysters on the half shell, mussels, shrimp, crab, corn on the cob and our great New England seafood feast, as well as our various seafood rolls, are all mouth watering and prepared fresh. Abbott’s offers a full line of soft drinks, but does not serve alcoholic beverages. Feel free to bring your own wine or beer. RESERVATIONS for the GENERAL PUBLIC are NOT needed or accepted. Dining is strictly "first come first served". For more information about group functions please call or email [email protected] for details (minimum of 25 people).